"i have been doing it this way for 45 years with no problems. 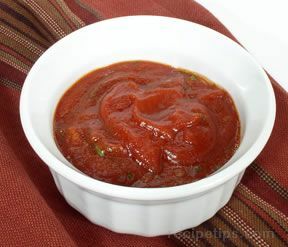 fast and easy"
Pick desired amount of fresh tomatoes. Boil water and blanch tomatoes to peal skin off. 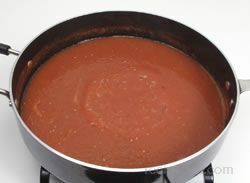 Place skinned tomatoes in a large pot and cook until boiling. Boil water in a small saucepan and let lids and rings rest in the water until ready for use. Wash desired sized jars and rinse well. Poor boiling hot water into clean jars. Empty water from one jar at a time and fill with boiling tomato mixture. Add canning salt and lemon juice to each filled jar. Place the lid on the jar. Screw the ring on the jar - very tightly. When done canning desired amount, place a clean kitchen towel over top of jars and let rest. You may hear a "pop" as jars begin to seal. Let sit for several hours. 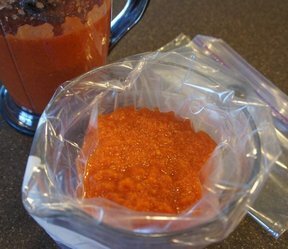 If there is a jar that does not seal you will need to store it in the fridge to use in the near future. All jars that do seal (when you press down on the lid it does not move) are fine to store on the self to use at a later date.